The program is written in "Processing". Processing is based on Java so you might need to install that too. Without needing to understand the program, you can easlily change the parameters in it. 1/ Download Processing FREE from www.processing.org/download download for your operating system. I originally used "Download 2.0 Beta 6 (2 November 2012)" for Windows 64bit; It seems fine on version 2 - Tested on Version 2.2.1 Jan 2015. I last tested Version 3.0.1 Jan 2016. 2/ Install Processing, it should be pretty obvious how to do this (just export the directory from a zip file). 2a/ Install Video Library. Run processing (processing.exe), click on Sketch tab / Import Library..., click Add Library, scroll down to "Video" and click install. 4/ Place the unzipped directories somewhere sensible then open one of the .pdefiles within with processing.exe (or run processing and open the .pde file from there. 5/ A little window with the source program appears. Run it by clicking on the "play" button. 7/ The movie plays and the slit is indicated by a thin green line and the final image is built up. After few seconds the window closes. Note: the image shown may be a distorted view of the actual image .tiff file output. 8/ You will find a new .tiff file in the same folder as the .pde program. You can now replace the .mov with your own and change the program parameters if neccessary (change the source code, so it may be worth saving the original version!) - I hope I have commented them sufficiently so this should be very easy. Run again and see your new artwork appear. Link to old versions - just in case. slit_cam_v1_00 Initial release. Any size video, horizontal and vertical slit. Start frame, left and right scans. Source code slit_cam_v1_00. slit_cam_imgs_v0_01 Pre-release version to process input images instead of a movie. 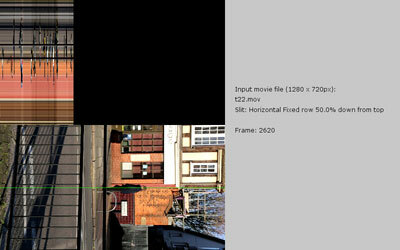 Source code slit_cam_imgs_v0_01.